Atheist philosopher Peter Boghossian believes that faith is pretending to know things you don’t know (May 6, 2012 public lecture – richarddawkins.net/). As a former atheist, I find that statement both challenging and strange. Let me explain why. We need to first understand the use of terms for the purpose of enlightened dialog. 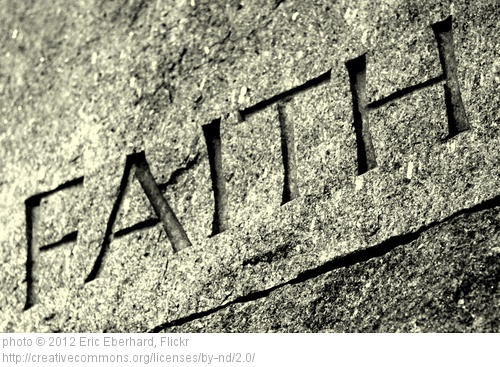 According to one English dictionary, the word faith means “strong belief or trust in someone or something” (Merriam-Webster). Another English dictionary defines faith as “complete trust or confidence in someone or something” (Oxford Dictionaries). From those two well-established and recognized knowledge sources for the English language we understand that faith is strong or complete trust and confidence in a person or a thing. Next, let’s look at the word “pretend.” It is defined in English dictionaries as “to act as if something is true when it is not true” (Merriam-Webster) and “speak and act so as to make it appear that something is the case when in fact it is not” (Oxford Dictionaries). Yes, I believe Dr. Boghossian, who is a teacher of philosophy (philo-sophia – friend, lover of wisdom), either misunderstands the usage of both the English and Koine Greek languages or may be purposely using contradictory terms for the purpose of misleading and misdirecting. I will assume that he lacks the understanding of the terms rather than suppose a purpose of misdirection. What happened to me, that has happened to many other atheists, was to investigate the truth claims of Christianity and find them true. What is a free-thinking truth-seeker to do with truth? Believe it or only pretend to believe it? To know that something is not true but pretend to believe it is true is at best unreasonable and at worst fraudulent. I do not view my beliefs to be either unreasonable or fraudulent. I do not view the beliefs of other former atheists who now believe in God to be either unreasonable or fraudulent. We are not playing games nor are we pretending. We know what we believe and believe what we know. That is faith. The strong confidence that I and other former atheists have in Christianity is based on evidence that we have investigated and determined to be true. If atheists investigate that same evidence and determine it to not be true, are either of us pretending? No, we have a difference of opinion about the credibility or factualness of the evidence. We both have “faith” in what we believe about the evidence. I understand why people have differing views about evidence and accept that as part of the truth-determining process. However, for Dr. Boghossian to claim that what I and other former atheists have done is to pretend to know things that we don’t know is naïve at best and dishonest at worst. So, the good news of atheism is to embrace reason. What does that mean? The word reason means “a statement or fact that explains why something is the way it is, why someone does, thinks, or says something, or why someone behaves a certain way, a statement offered in explanation or justification, a sufficient ground of explanation or of logical defense” (Merriam-Webster) and “a cause, explanation, or justification for an action or event, the power of the mind to think, understand, and form judgments by a process of logic” (Oxford Dictionaries). So, how does embracing reason as an atheist differ from embracing reason as a theist if both are using the power of their minds to think, understand, and form judgments by a process of logic during the search for causes, explanations or justifications for an action or event? Dr. Boghossian may have a low opinion of the power of a Christian’s mind to think, understand, and form judgments (I know I did when I was an atheist), but that low opinion does not logically lead to believing that Christians pretend to know what they do not know. To say that out loud is both unreasonable and embarrassing for the professor. He may have done better to emphasize his belief that faith is a “cognitive sickness” and that those who attempt to get to the truth using faith are delusional (philosophynews.com). Christians are used to being called names, so that’s fine if the professor wants to do that. However, to move from name calling to illogical and unreasonable claims about the meaning of faith seems beneath the position of an instructor in knowledge and wisdom at the college level. So, what is the Christian response to the ongoing discussion between atheist and theist? For one thing, we have a serious difference of opinion about evidence. I became a Christian based on evidence, the same evidence my atheist friends deny. We can’t both be right, so someone is wrong. I believe that atheism is wrong and theism is right, therefore my decision to become a Christian. However, based on the Christian belief that God created the human race and deemed people important enough to send His Son to sacrifice Himself for them so that they could know the truth and be set free, I believe it’s important to have and demonstrate God’s love for all who disagree. That includes Dr. Boghossian and other atheists who have as their goal turning believers from faith in God to, as they say, embrace reason. What amazes me about Atheists besides the fact that their RELIGION OF EVOLUTIONARY THOUGHT requires far more FAITH of this type than believing the bible does, is that they MUST REDEFINE FAITH in order to make it fit their paradigm of belief when the bible plainly states that FAITH CONTAINS BOTH RESULTS OF INVESTIGATIVE SCIENCE! JFB commentary states it well………. Through faith, the future object of Christian hope, in its beginning, is already present. True faith infers the reality of the objects believed in and honed for (Heb_11:6). Hugo De St. Victor distinguished faith from hope. By faith alone we are sure of eternal things that they ARE: but by hope we are confident that WE SHALL HAVE them. All hope presupposes faith (Rom_8:25). Evidence — “demonstration”: convincing proof to the believer: the soul thereby seeing what the eye cannot see. things not seen — the whole invisible and spiritual world: not things future and things pleasant, as the “things hoped for,” but also the past and present, and those the reverse of pleasant. “Eternal life is promised to us, but it is when we are dead: we are told of a blessed resurrection, but meanwhile we molder in the dust; we are declared to be justified, and sin dwells in us; we hear that we are blessed, meantime we are overwhelmed in endless miseries: we are promised abundance of all goods, but we still endure hunger and thirst; God declares He will immediately come to our help, but He seems deaf to our cries. What should we do if we had not faith and hope to lean on, and if our mind did not emerge amidst the darkness above the world by the shining of the Word and Spirit of God?” [Calvin]. Faith is an assent unto truths credible upon the testimony of God (not on the reasonableness of the thing revealed, though by this we may judge as to whether it be what it professes, a genuine revelation), delivered unto us in the writings of the apostles and prophets. Thus Christ’s ascension is the cause, and His absence the crown, of our faith: because He ascended, we the more believe, and because we believe in Him who hath ascended, our faith is the more accepted [Bishop Pearson]. Faith believes what it sees not; for if thou seest there is no faith; the Lord has gone away so as not to be seen: He is hidden that He may be believed; the yearning desire by faith after Him who is unseen is the preparation of a heavenly mansion for us; when He shall be seen it shall be given to us as the reward of faith [Augustine]. As Revelation deals with spiritual and invisible things exclusively, faith is the faculty needed by us, since it is the evidence of things not seen. By faith we venture our eternal interests on the bare word of God, and this is altogether reasonable. Substance and Evidence play pivotal roles in belief by definition, so Atheists must redefine it with lame bumper-sticker statements that only kick the proverbial issue of the real truth down the path long enough to change the conversation to a more manageable topic using large words and insults. They speak over our heads and demean our responses as ignorant. I am personally unimpressed with all Atheist banter concerning anything related to life in general but the beginnings of life in particular. They must prove that LIFE as it is right now in all it’s irreducible complexity came from not only NOTHING but nothing that somehow came together into a complex first life form that eventually became us. Now that’s believable??? After all is there really anything about Evolution (Macro) that they KNOW AS FACT? So they are guilty of not knowing anything about a theory disguised as science! Neo-atheists know they are right and other not only wrong but deluded. Deluded people are not worthy of their wisdom only ridicules and catchy philosophical bites. Thank you for responding poor reasoning with gentle exposition of terms used showing how unreasonable Boghossian’s claim is. I’m a Christian and an engineer. I work with other engineers and scientists who are also Christians. We’ve all been through college and we all use analytic thinking skills every day to solve problems. Like you, I was once an atheist, but I embraced reason, examined the evidence and eventually accepted Jesus into my life. I’m also embarrassed for atheists that constantly say Christians aren’t thinkers, or they’re stuck in the dark ages or they believe in fairy tales. I’ve met many atheists, that to be quite honest, couldn’t hold a candle to my thinking skills. Yet they can all wax poetic with their phrases like “You’re not embracing reason or thinking clearly”, just because they read it on an atheist’s website or in an atheist’s book. In reality it is the atheist that won’t embrace reason and the only reason they embrace atheism is because they live very immoral lifestyles and do not want to be held accountable by anyone for some of the things they do in their life. I’ve seen it time and time again – they hide behind the guise of “science, reason and superior intellect” for the sole purpose of their lifestyle. Never realizing, or just turning a blind eye to the fact that there are a lot of Christian scientists, doctors, engineers, philosophers and others that have embraced reason and chose Jesus. When I first accepted Jesus into my life some of the things atheists said bothered me. But now I actually enjoy reading their reveries because it forces Christians to always keep studying, learning and “embracing reason”. I often wonder if those atheists who appeal to pure reason and in a firm departure from all “religious, superstitious, nonsense” ever take the time to honestly think about where their “faith” in pure reason comes from. Why should an atheist trust the brain? Even more troubling for the atheist, why should he trust that the physical world is really intelligible in the first place? As part of my conversion to Christianity, I realized scientists had to have as many articles of “faith” as does the Christian—they just don’t refer to their beliefs as such. Both of us have faith, Christians just happen to be honest about it.